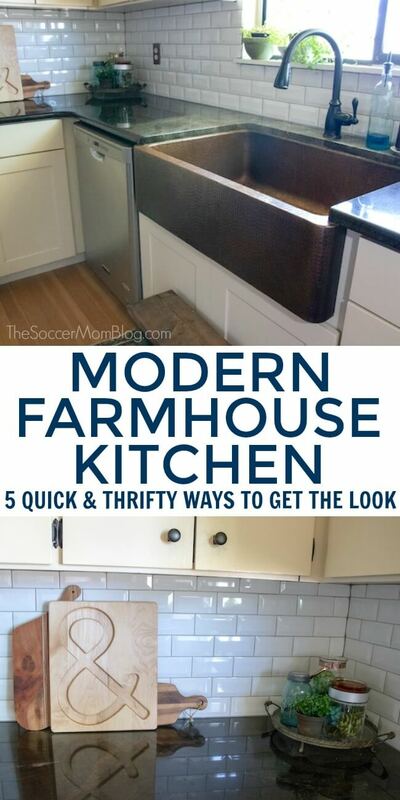 Inside: 5 simple, affordable ways to create a modern farmhouse kitchen in your own home. Sponsored by LightStream, an online lending division of SunTrust Bank. Each January for the past five years, LightStream, an online lending division of SunTrust Bank, has asked Harris Poll to survey homeowners to discover what they have in mind for renovations in the coming year. This year, 58% of those surveyed said they’re planning to spend money on a home renovation project. One of the most popular areas of the home to renovate and/or repair is the kitchen. If you’ve been on Pinterest lately, you’ve likely seen that farmhouse kitchens are sweeping the country! 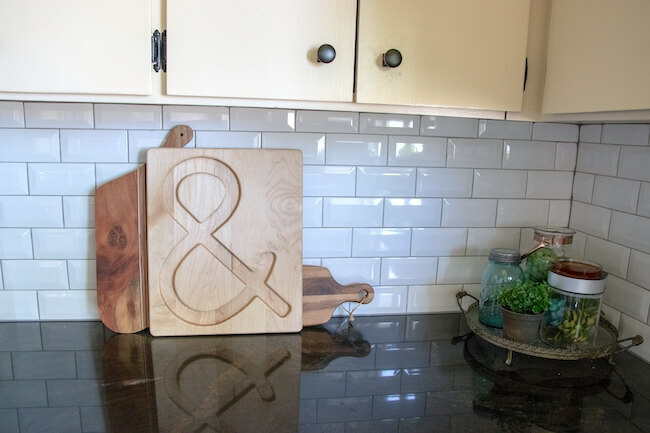 In this post, we’ll show you 5 easy ways to get the farmhouse kitchen look in your own home. We’ll also break down how to do it in the most economical way. When it comes to home renovation here are some ideas of ways to beautify your space. 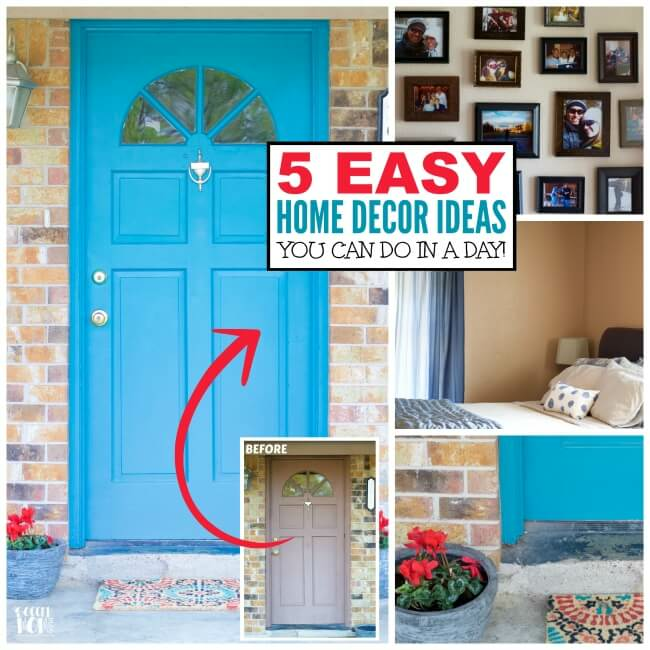 Most of these are all fairly quick, easy, and inexpensive. 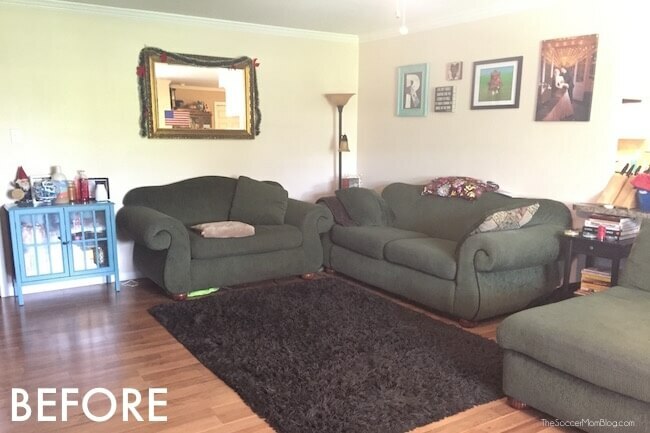 As you can see from the before/after photos, the difference in a renovated kitchen is amazing! Bonus: A recently renovated kitchen increases the value of your home should you ever decide to sell. If you’ve been considering a kitchen redo, I want to encourage you to jump right in! Follow our simple tips and you may find that it is not as complicated, time consuming and expensive as you expected! One thing I love about a farmhouse kitchen is the light, airy feel. But what do you do if your cabinets are dark? One of the easiest ways to brighten a kitchen is to paint the cabinets, rather than replace them. Not only is this faster, but it’s a lot more budget-friendly! 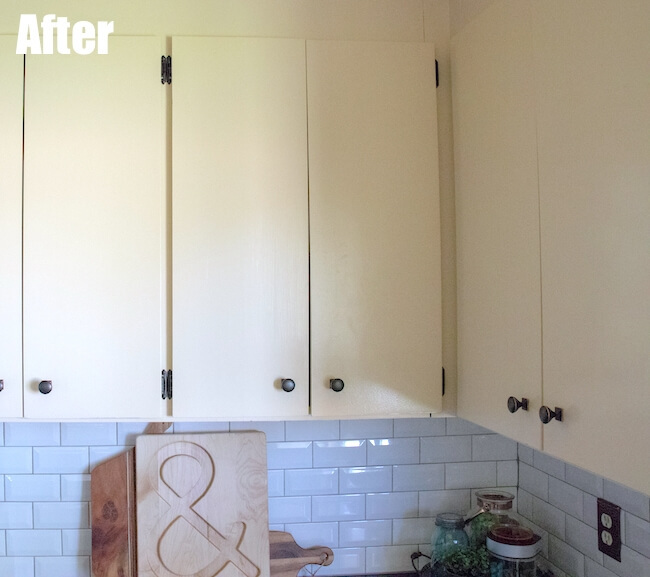 This simple kitchen upgrade can be done on your own with a few buckets of paint. We painted our walls a nice creamy white then removed our cabinet doors and cleaned, sanded and then painted our cabinets a nice white color to match our lower cabinets that we did purchase and have installed. You can easily color match by taking a bottom door into any paint shop. 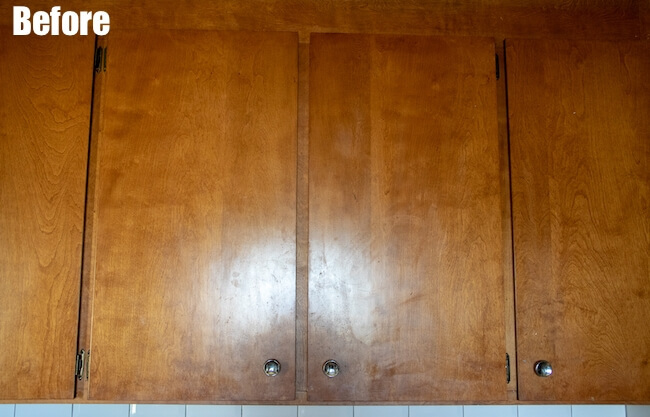 TIP: Make sure you find a good clear sealant that makes wiping down your cabinets easy! 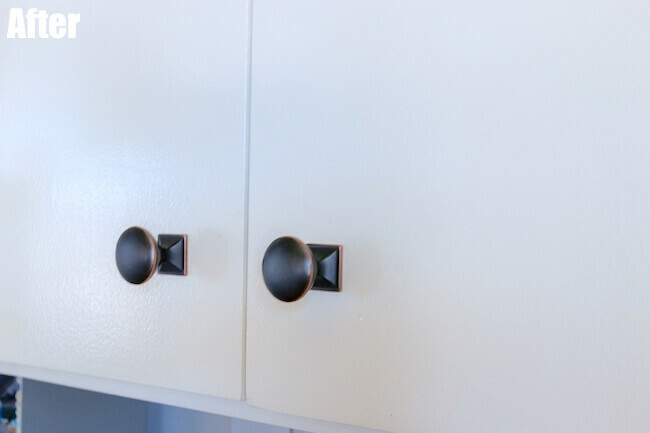 In addition to painting cabinets a lighter color, you can make them look brand new by simply replacing the handles/knobs. 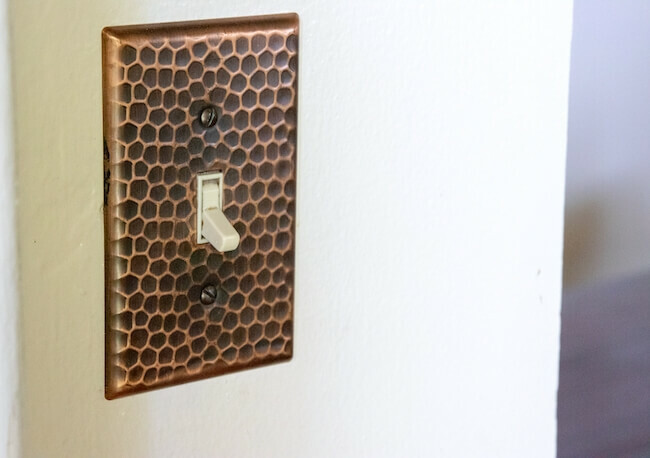 This quick, thrifty update is done in a matter of minutes, and all you need is a hand drill! 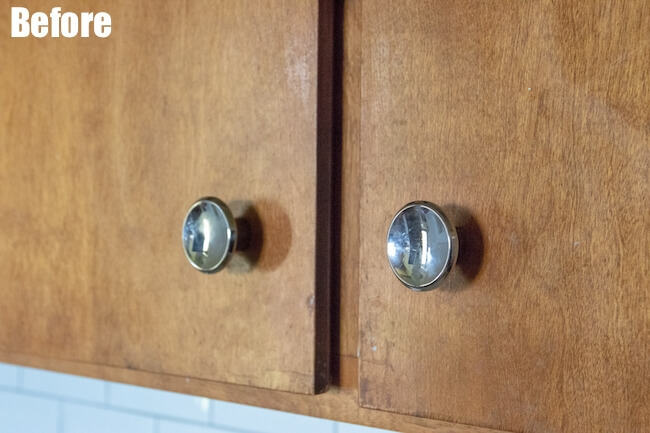 TIP: For best results, let freshly-painted cabinets dry fully for a few days before adding knobs. A beautiful counter top is a stellar touch to a kitchen renovation. While it is possible to do yourself, this might be one task to invest in a professional to do it right. Price ranges greatly from laminate being on the low end and marble or granite at the higher end of cost. 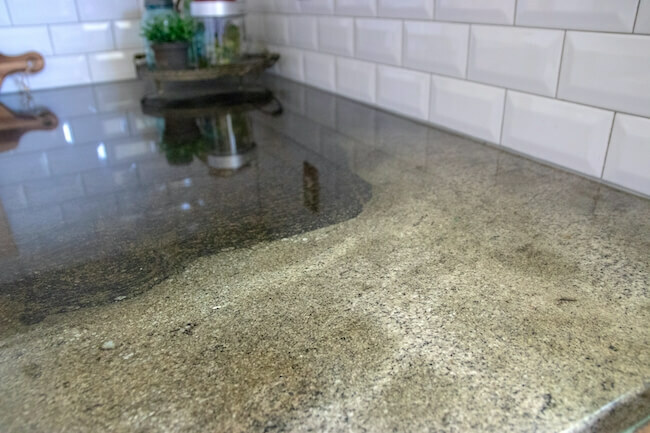 You can even get concrete created counters that offers a neat industrial and clean look with the feel much of granite but often much more affordable at times. According to LightStream’s 2018 Home Improvement Survey, about a third of homeowners say they’ll pay for some portion of their project with a credit card. However, most credit cards carry high interest rates, so if not paid off right away, those home improvements can end up costing a lot more than expected! Instead of running up your credit card bill, consider a home improvement loan for any professional renovations. Click here to learn more about home improvement loans from LightStream and their $100 Loan Experience Guarantee. (See important details here). 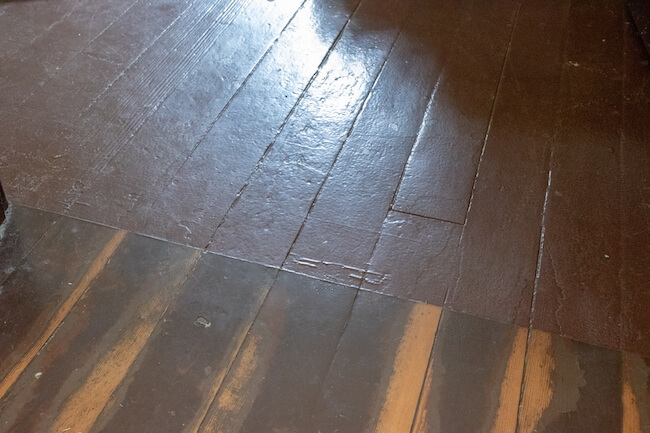 If you already have hardwood floors, don’t rip them up, refinish them! This can be done yourself by renting a floor sander and sanding and then refinishing your floors with a new stain and sealant. If you don’t have hardwood floors, laminate tiles are another easy DIY to get the farmhouse kitchen look. There are so many options that look like real wood, but are inexpensive to purchase and install, plus they’re a breeze to clean and maintain. For real tiles, consider a professional, as this requires special tools such as a tile cutter. For a true “wow” factor, a new sink will do the trick! 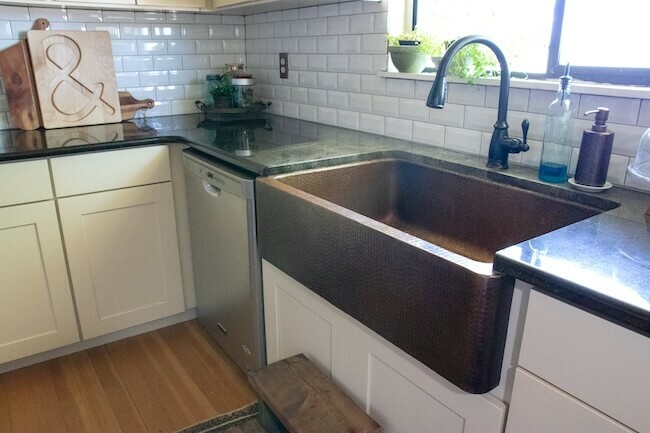 We love our hammered copper farmhouse/apron kitchen sink. It’s super practical and looks absolutely gorgeous! Find a way to tie in your personal style with all of these things to create a kitchen that visually flows together well. Leave a cushion for unexpected expenses. Stay focused on your original renovation plan – extras add up! Thoughtfully consider all of your financing options. Click here to learn more about current trends from the LightStream 2018 Home Improvement Survey! LightStream is a national online lending division of SunTrust Bank, providing loans for practically any purpose. Financing is available in all 50 states (people need not have a SunTrust account in order to apply). And, they plant a tree with every loan — more than 1,500 acres and counting! This is a sponsored conversation written by me on behalf of LightStream, an online lending division of SunTrust Bank. The opinions and text are all mine.